Another Cast Manifold - Miata Turbo Forum - Boost cars, acquire cats. 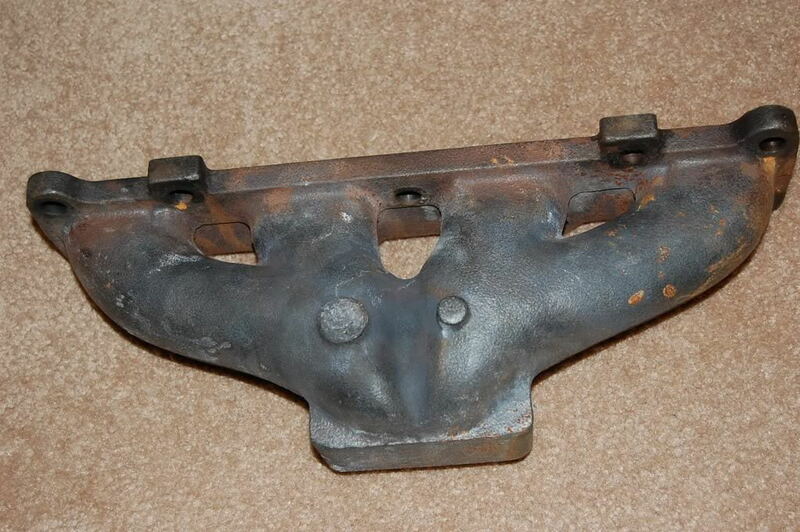 The manifold is machined from a ductile iron casting poured by a very experienced foundry. I made the pattern and core box myself. The four into one design is very close to equal length runners. All contours and curves are large radii and carefully controlled cross sections. The configuration features a remote wastegate. Virtually any bolt pattern wastegate can be fit to the cast pad. Placement of the turbo and wastegate do not require hammering or sawing up of the body/frame structure on installation. The design is purposely configured such that the four runner collector offers the wastegate equal access to the exhaust gasses as has the turbo itself. Flanged to fit the T25 to T35 turbos and almost all others. Ten mm by 1.5 studs are fit to the manifold for anchoring the turbo. The 10 mm stud is approximately twice the strength of an 8 mm stud. The 8 mm studs can be fit on request. Wrenching access remains quite generous. V-Clamp turbos and wastegates can be fit as well as the flanged turbos. EGR and EGT ports/bosses are cast in place, but machined only on request. The head flange features three thermal expansion slots. The center head flange bolt hole locates the manifold to the head. The remaining eight holes get larger with increasing distance from the center. The hole diameters are sized to prevent and thermal expansion induced bending in the retaining studs on the head. The casting and machining are deburred both inside and outside for cosmetics. Ceramic coating is readily available on request. Pics of it mounted? EFR fitment? Looking sharp, its always nice to have more options on the market. Wow, that's a high quality manifold! Makes me want to put a turbo back on my car. So pretty much, I took a factory FM manifold and modified it into this. I'd buy it...If this was my first rodeo. Unfortunately for you, Corky Bell...I'm a clown. Looks great. Miata community going places. looks sorta similar to the HKS? Last edited by 18psi; 09-28-2015 at 01:04 PM. I like it. I'm all for more options. More details Corky! Glad to finally see the cast ones done. I just got off the phone with Begi. Price is $699 for the cast manifold. So a bit more pricey then their previous one. It is also EWG only. So that will make things interesting. I will probably order one sometime next year to check it out. No manifold is EWG only. Stephanie "claimed" that it was not possible to run an IWG. I have since shot her an email asking for pictures of the part where the EWG goes. I can't see how you could not possibly put some sort of plate or something over to block the hole. I really don't want to run an EWG on my 2554 or EFR 6258.
block off plate + ignore = IWG. I mean that is what I thought of, but thought maybe Stephanie knew something I did not. Hopefully she gets back to me with some more pictures. I have to say, I ran an external gate on my GT3271 setup (cheap ebay Tial knockoff) and it worked fantastic. Being a dual port wastegate, I could run 6 PSI (wastegate spring pressure) or 28 PSI using the dual ports, and either setup the wastegate only began to crack open at 2-3 PSI before target boost. And boost was the flattest line you've ever seen, typically within 1kPa of target! It was stupid flat, and it worked perfect at 30*F or 100*F.
External gates are cheap, reliable, and offer the best boost control I've ever seen. I don't understand why they are not used more often, or why some people intentionally avoid them. Outside of miataland, external gates are pretty common on high powered setups. I'm glad BEGI makes this manifold now. I think they need to drop the price some if they expect to sell a boatload of them, but otherwise it's a nice offering. I am lazy and don't want to plumb in an extra pipe. I also don't want to have to weld the wastegate hole closed on my t25's. I want to try them out on multiple manifold setups. Hard to deny the advantages of a remote gate if properly positioned. The bigger diaphragm area to valve area reduces the bad effect exhaust gas has on the gate. Putting the thing in a position for ease of gas flow (not at some right angle) ups the flow when everything is wide open. Easier to make a dump directly to atmo. When done that way the turbine outlet esentially becomes about 20% bigger. The back side of the diaphragm is easliy accessible for playing tricks. Hard to argue against. Welding an integral valve shut is a 30 second proposition. making something to hold it shut w/o welding might take 30 minutes. Come on SHUI! Worst case, (not best case) use both. Worries of boost creep would probably not cause a loss of sleep. wrong thread. stupid phone app. Last edited by wackbards; 11-22-2016 at 09:21 PM.